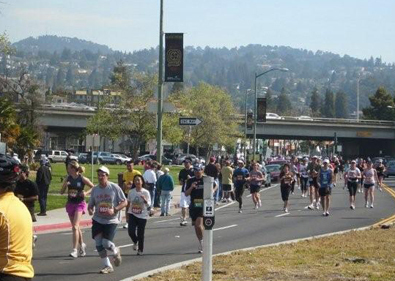 Yesterday morning was the first Oakland Marathon in 25 years. I wish I could have run in it. Sadly my muscles are weary. My ankle and knee joints are lubricated by sandpaper, and I’m carrying a 17 lb beer baby, which I shall name Hoegaarden. 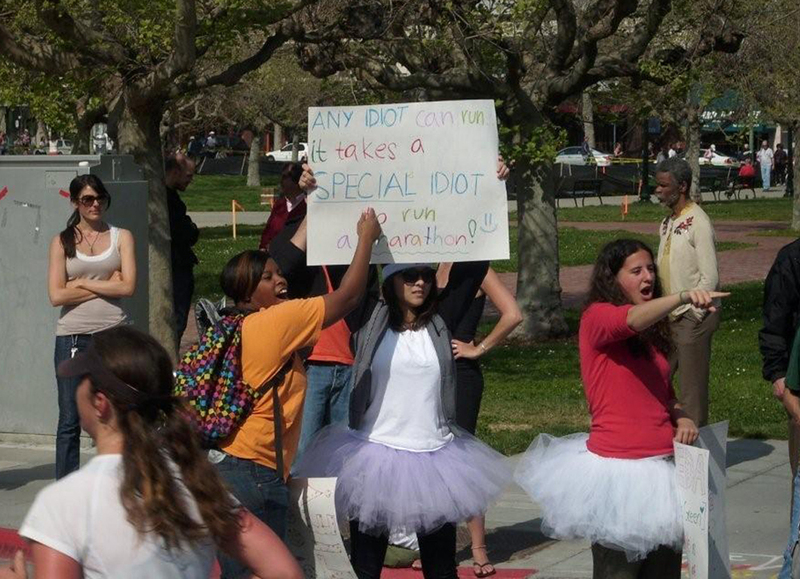 I have run a marathon and I can tell you it really does take a special idiot to run one. You have to really enjoy running; I mean almost like it’s an addiction. There is a good deal of physical pain and mental anguish when running for 26.2 miles without a half-time break, an intermission, or a long nap—believe me. 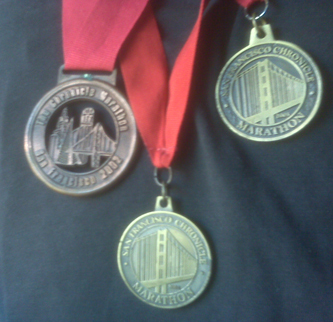 I ran my first marathon 8 years ago in San Francisco (I have run 2 halves since then, and those are a piece of cake comparatively) and stupidly I didn’t train. The most I had ever run was 9 miles. 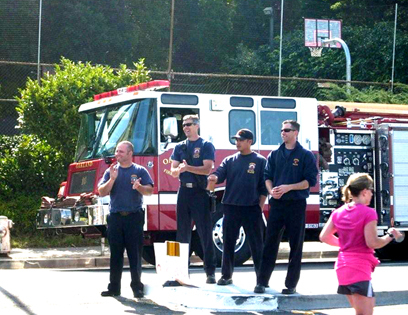 Even as kids in England, my brother and I would run a lot, but we’d never done anything like 26.2 miles, and consequently, when I got to mile 16 in the S.F. Marathon, my legs crapped out and started wobbling like jelly. I had to stop for a second because my body and brain had conspired, and I had forgotten how to put one foot in front of the other. It was a little scary. I regained my sense of balance and then the cramps came, seizing up every fiber of my lower half. From my toes to my hips I was cramping up and in excruciating pain. AND I still had 10 miles to go! What the hell was I going to do? It was unbearable, but I jogged on and every twenty yards or so I would have to either stop to stretch, or just stand there and ride out the surges of pain. It sucked. By Mile 20 if an ambulance had pulled up alongside me I would have gingerly climbed in and begged them to drive me to the finish, pick up my medal, and then if I was still alive take me to the hospital and if I wasn’t breathing, then straight to the embalmer. Just after Mile 24 with 2.2 miles to go I was at my lowest. I’d probably lost 15-20 lbs in sweat and was delirious. I had not only met my match, it had made me feel like a speck of dirt upon a speck of dirt. I was dust. But then something happened. I was hobbling along a quiet part of the course down near China Basin, being cheered and encouraged by other runners passing me, when a woman who was likely in her mid-to late-70’s jogged slowly past me. I am nothing, I thought, and burst into tears at the sheer spirit this woman had in her old, skinny body. It was a life-changing moment. I had achieved complete and utter nothingness. I contemplated tackling her from behind so that she didn’t cross the finish before me. But no, I could never do that. The old woman inspired me. I had to finish the race and do it in a way I could be proud of, and so I began running. I mean really running. My body had one more sprint left in it and by God I was going to cross that finish line like I’d sprinted the whole 26.2 miles. I was a mile away and I could hear loud cheering coming from the Embarcadero. It was intense. The closer I got to the finish line, the louder the crowd’s cheering became. It drew me in and I flew past the old lady and the twenty or so other runners that had passed me earlier offering support. I crossed the line and collapsed in my Mylar cloak on the grassy area to the side. I had done it. I had run a marathon, and had the medal to prove it. And like everyone that ran in yesterday’s Oakland Marathon, and like my old running partner, Step, The Bay Area Brit is a special kind of idiot. I shared your ORF entry with a few people. First, my brother Jonathan who is a PR guy (see http://www.rhudy.biz) and whose first job out of college was driving Oscar Meyer’s wienermobile. Second, a college professor at Drexel University in Philadelphia named Steve Wrenn who went to Virginia Tech when I did–in 2002 we ran the first 10k of the New York City Marathon together after rendez-vousing in the world’s longest coffee line at the staging area. Thirdly, my friend Mike Clark is an Air Force ROTC guy who works as a civilian on Hanscom’s Air Force Base, outside Boston, MA. Finally, Kristina from Max’s who wants to run a marathon after she finishes her graduate degree in Finance in May–she moved to Dublin, CA with her boyfriend Chad earlier in the year. These exchanges over the last seventy-two hours really became a BOFA, Breath Of Fresh Air! This was my favorite BAB so far! Keep it up, Matty Stone…. I had great chuckles and laughing out loud reading about the special idiots!